My name is Araz, I live near Montreal, Canada. The photo below is me in my workshop. PEG has a thriving community on Facebook. Come see what it’s all about. Welcome Guitar Builders! 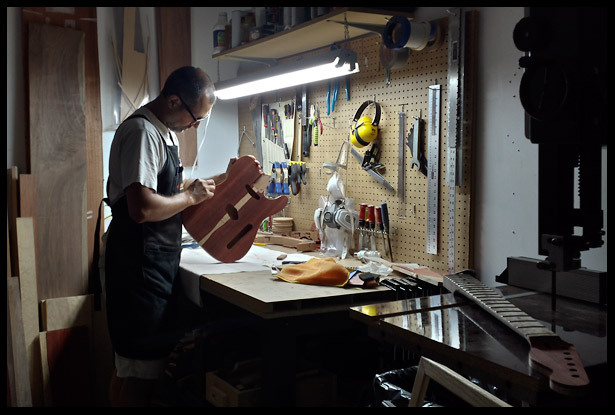 This amazing community is all about sharing the process of building electric guitars! The rules of the group are very simple: 1) be respectful, 2) ask for help when you need it, 3) help others when you can and 4) have fun! You can i) introduce yourself to the group with a short bio (optional) or ii) jump right into the discussions or iii) just hang out in the background and absorb the discussions. Selling guitar-building related items is permitted (tools, jigs, parts, pickups, wood, necks, etc.). Please use the “Sell Something” option in the post menu. Besides that, show us your jigs, your works-in-progress, your mistakes, your finished creations, your workshop, links to videos, resources, etc. You’ll find plenty of support in this group to maintain your guitar-building addiction. You can also contact me by using the form below. Do you have feedback, ideas, comments, suggestions, etc. Let me know. Are you interested in writing an article for PEG? You can get exposure for yourself and traffic back to your website. Is there something you know how to do really well? Do you have an idea for a tutorial you want to write? Or maybe you already wrote something and it’s just sitting on your hard drive?